After each week of the NFL regular season, and once our exhaustive All-22 review processes are in the books, PFF will be bringing you the insights from our play-by-play grading of every NFL game with our Team of the Week. This was Fitzpatrick at his Fitzmagic best. Delivering dime after dime and picking the Saints apart with back-shoulder throws, he delivered one of the best quarterbacking performances you’ll see all season. On throws 20-plus yards downfield, he went 4-for-5 for 179 yards and three touchdowns. Jordan may not have led the NFL in yards or touchdowns this week, but he was consistently impressive in the loss to the Packers. From 15 carries, he forced three missed tackles and averaged 3.9 yards after contact per attempt. Just like Fitzpatrick, Jackson could do no wrong on Sunday, dominating against New Orleans. Despite being limited to just 13 snaps as a receiver due to a couple of injuries, Jackson averaged 11.23 yards per route run, the most of any wide receiver this week. Similarly to Jackson, Hill just couldn’t be stopped, averaging 8.45 yards per route run in the win over the Chargers. He showcased how dangerous his speed is downfield, with two receptions on throws of 20-plus yards, and on shorter routes too, scoring on a jet sweep. A performance that came out of nowhere, Dissly was dynamic as a pass-catcher, averaging 5.25 yards per route run from 20 snaps as a receiver. Too much for the Broncos to handle, he averaged 22.3 yards after the catch per reception and forced a missed tackle. The third member of the Buccaneers offense in our Team of the Week, Evans finally got the better of Saints cornerback Marshon Lattimore at the third time of asking. When being covered by the Saints star cornerback, Evans picked up four catches for 115 yards and a touchdown. The Rams offensive line as a unit was fantastic, and that starts with Whitworth. He allowed just one hurry, and no hits or sacks, for 36 pass-blocking snaps in the win over the Raiders. Saffold produced a perfect 100.0 pass-blocking efficiency, with no pressures allowed all game. He also impressed as a run-blocker, producing the highest run-blocking grade among offensive guards this week. Paradis did allow a sack, but it was the only pressure he allowed from 42 pass-blocking snaps in the win over Seattle. He was also really impressive in the running game, producing the highest run-blocking grade at the position this week. Saffold’s teammate was our second-highest graded run-blocking guard this week, trailing only his teammate. Similarly, he too produced a perfect 100.0 pass-blocking efficiency rating, with no pressures allowed all game. Like Whitworth, Havenstein didn’t allow any sacks or hits, and just one hurry, from 36 pass-blocking snaps. That’s an impressive duo, with quarterback Jared Goff having to deal with just two pressures against his tackles over the course of the game. 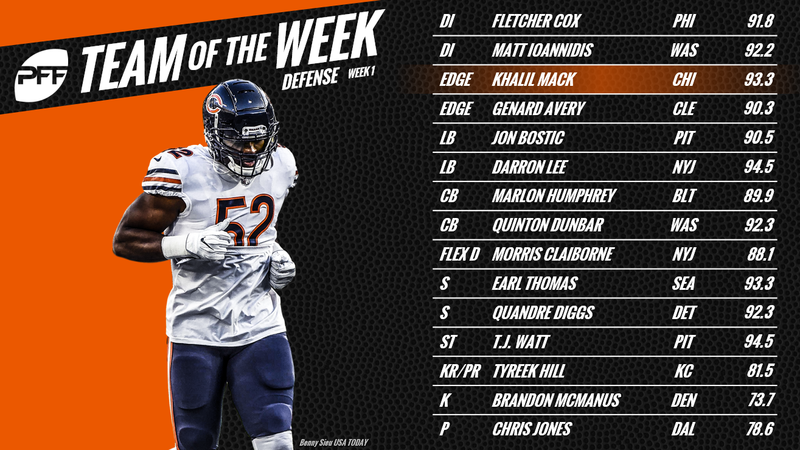 The third member of the Bears to make this week’s Team of the Week, Mack was dominant in his debut, particularly in the first half. On the field for 32 pass-rushing snaps in the game, he racked up a sack and five hurries. He also had a forced fumble on one of those sacks and returned an interception for a touchdown. Continuing right where he left off in 2017, Cox was dominant in the season opener against the Atlanta Falcons. From 48 snaps as a pass-rusher, he picked up seven total pressures, including a sack and three quarterback hits. Ioannidis saw just 27 snaps, but after a performance like that, there will be calls for him to see even more playing time. On the field for 19 pass-rushing snaps, he picked up a sack and three hurries, providing a consistent pass-rushing threat against the Cardinals. Avery was a force against the run and as a pass-rusher in his regular season debut. From 29 pass-rushing attempts, he picked up a sack, a hit and a hurry, and finished the game with three total defensive stops. Not bad for a fifth-round rookie. Bostic delivered against the run and in coverage for the Steelers, finishing the game with four defensive stops. While he allowed two receptions in coverage, they totaled just four yards. Lee was outstanding in coverage for the Jets, and not just because of his pick-six. He was targeted 13 times all night, allowing just 6.4 yards per catch, and finishing the game with two interceptions and a pass breakup. From 27 snaps in coverage, Dunbar allowed just two receptions for 10 yards and came away with an interception. All of that resulted in a passer rating allowed of just 8.3 on the day, making life miserable for Cardinals quarterback Sam Bradford. In their first game without cornerback Jimmy Smith, another Ravens cornerback makes the Team of the Week. Humphrey was outstanding, allowing just two receptions for six yards from six targets, and came away with two pass breakups. If it was ever in doubt, Thomas’ importance to the Seahawks defense was on display early in their loss to the Broncos, with the free safety snagging an interception. He also didn’t allow a single reception on plays where he was the primary coverage defender, sealing an impressive return to the field, even if it was in a losing effort. Diggs season could not have gotten off to a better start as he picked off the first pass of rookie Sam Darnold and took it to the house for six. Years from now, if Darnold goes on to have a long and storied career, that will be a trivia answer to remember, but for this week it was just an incredible play by Diggs, who produced the highest coverage grade among any safety in the league this week. Targeted five times on the night, Claiborne allowed two catches for 31 yards. Of the three passes that weren’t caught, Claiborne broke one up and picked off another. On the night, he allowed a passer rating of just 21.7 on throws into his coverage. McManus was perfect on all three extra points and connected on both field goals from 50-plus yards. He did everything that was asked of him in the Broncos win and earns himself a spot on the Team of the Week in the process. As shocking as it may be to not have Michael Dickson here, the fact of the matter is that Jones was the best punter in the league yesterday. He averaged 4.72 seconds of hang time on six kicks, with two of those landing inside the opposing 20-yard line. 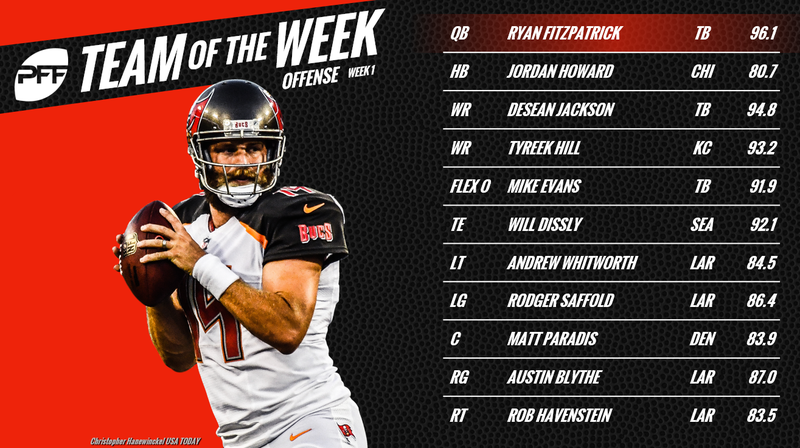 It’s only Week 1 and Hill is already up to two appearances on the PFF Team of the Week. A 91-yard punt return for a touchdown to go along with his exploits on offense will do that for you. Watt’s blocked field goal is the main reason right now that the Pittsburgh Steelers and Cleveland Browns have 0-0-1 records, and the Steelers aren’t the lone team at the foot of the AFC North after one week.